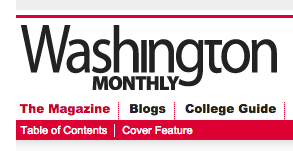 Credit where credit is due: George Cornelius at the higher ed blog Finding My College drew attention to this excellent reporting by Washington Monthly about college recruitment practices. I would only add that what’s really being discussed here isn’t the college as a complete entity, but recruiting and admissions offices, which are under intense pressure to recruit students. Ten Ways Colleges Work You Over by Stephen Burd and Rachel Fishman | The Washington Monthly.